The Public Monuments and Sculpture Association’s National Recording Project (NRP) was established to catalogue every piece of public sculpture and every public monument in the British Isles and to maintain the resulting information in digital form for public access. The country is divided into Regional Archive Centres (RACs), mostly run from academic institutions. Each is responsible for the survey and digitised record of its local area. Following a successful funding bid to the Heritage Lottery Fund, the University of Brighton was selected to house the PMSA Regional Archive. The two year project conducted a survey of the diverse range of monuments and sculpture in the cities, towns and villages of Sussex and included editing the accompanying volume in the ‘Public Sculpture of Britain’ series published by Liverpool University Press. The survey includes, from all periods: conventional statues, monumental works, selected war memorials, architectural sculpture, art sculpture, memorial clocks, towers and fountains. These include those works that have ‘disappeared’. Detailed descriptive data is recorded as well as the objects’ general history, including that of inauguration events / unveiling ceremonies etc. A rich image archive is also kept. This exciting project was of great importance to the university and to the history of the region. Further information about the PMSA can be found at: www.pmsa.org.uk. 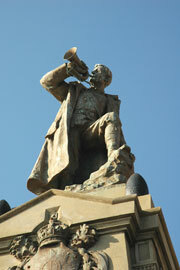 The online database for the National Recording Project for Sussex can be accessed at: www.publicsculpturesofsussex.co.uk.